Stamped concrete can really make the difference between a boring, gray patio to an exciting, texture hang out space. Here at Concrete Contractors Fayetteville, we can make your concrete patio resemble slate, stone, brick, and more, creating a cheaper alternative to more expensive construction options. Our team of experienced masons and workers have done many a stamping job, and can take your project to the next level. No matter where you have concrete, stamping is an option that can make your space more interesting and appealing. The designs stay solid and visible, and will stand the test of time- not to mention wear and tear. Stamping is an advanced technique that is well worth the time it takes to produce the effect, and our certified contractors have years of experience in making these designs crisp and well-pressed to your liking, as they should be. Not only is it cost-effective and looks sharp, but it also keeps your area looking refined and unique. 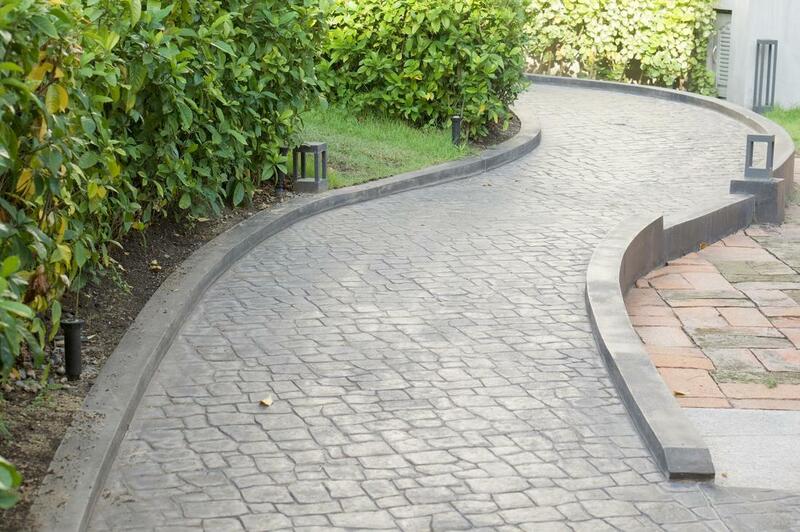 Concrete is more versatile than ever before thanks to innovations in the industry. With stamped concrete, your entryway and backyard can be more eye catching with this technique. Here at Concrete Contractors Fayetteville, we are excited to be able to provide this service to our clients. Many different clients have chosen this option, as it adds an extra "pop" of detail to your concrete areas, whether it be steps, patios, or walkways. There are tons of choices to choose from, from designs and textures to colors and depths. Every design concept is unique, and we have plenty of ideas that can fit your style. Our designers and masons have plenty of experience to help you choose just the right selection of stamped concrete to make your space have that "wow!" factor, while staying well within your budget and desires. Contact us today to find out how we can make your dreams become a fantastic reality. Here at Concrete Contractors Fayetteville, we are experienced in both indoor and outdoor stamped concrete. Whether it is for a covered porch, a walkway, or cook out patio, we can make your next big idea your next big reality. Our professional contractors know exactly how to properly produce the effect of stamped concrete. An inaccurately done stamp job can be disastrous, but with out extensive knowledge of stamping techniques, our masons will be sure your concrete looks great and fits our standards to the letter. We can make sure the job is being done quickly and efficiently, while still assuring you that it is done correctly and to the highest of expectations. Concrete Contractors Fayetteville has been serving the greater Fayetteville, AR area for over twenty years. We have the most affordable rates on the market for beautiful stamped concrete, and our professional, licensed, and insured team can ensure that the proper work is completed safely and quickly. Our team is prepared to team up with you and be sure that your idea translates into real life easily and swiftly. Feel free to call Concrete Contractors Fayetteville to get a quote for stamped concrete for your home, whether indoors or out. There is a reason that customers have been coming to us again and again for many years- because our work is quality and cost-effective.